Good news, I'm writing a second book! I can't tell you the details, but it's gonna be big. Well, little actually, but big. It'll be out November, 2010, and it may or may not mention football. OK, football will be mentioned, but I can't tell you how yet. For now, let's focus on this football season. Yes, boys and girls, it's that time of year again. Emmitt Smith and I are ready for some football: We're getting our pork recipes goin' on offense. What's that? You don't have a game plan? OK, I'll pull out my play book for you. Just don't share it with the Giants. I can't stand the Giants. Keep it simple. It should be hearty, laid-back grub. No fuss. No frills. No sushi. Include foods you can hold in your hand like sandwiches, burgers, and pizza. That leaves your other hand free to switch to other games during commercials. Anything messy, cheesy, spicy, and/or fried is always welcome. Think mac n' cheese, BBQ baby back ribs, beer battered onion rings, and super nachos. The more dishes that include bacon the better. Including desserts. You can't go wrong with anything Mexican. Hot stick-to-your-ribs dishes like chili, sloppy joes, and jumbalaya are especially good for the second half of the season, when temps dip and fans need some comfort. In addition to drinking it, feel free to add beer to any dish possible. Jeff and I are having Pork Tenderloin Sandwiches for Monday Night Football. A pork tenderloin sandwich is perfect football food: it's simple, filling, can be held in one hand, and gets along well with cold beer. If you've never had one, think of it as a chicken fried steak, but with pork, and no gravy. We're ready for some football. Are you? What's your favorite football food? 1. Trim any fat off of the cutlets. Then using a meat mallet, pound the cutlets to 1/8-inch thickness. 2. In a small bowl whisk eggs, milk, salt, and pepper. Place flour in a shallow plate. Place cornmeal in a separate shallow plate. 3. Warm oil in a large skillet over medium heat. 4. Dip one cutlet at a time in the egg mixture, then dredge in flour. Dip in the egg again, then dredge in cornmeal, until completely coated. Place in hot oil. Fry 3-4 minutes. Flip once; fry 2-3 minutes, or until golden brown and crisp. 5. Spread mayo on the insides of the hamburger buns. Place one cutlet on each bottom half of the buns. Top with half the pickle chips and onion slices, if using. Close the sandwiches, and eat 'em while they're hot. Patriots' Potato Pizza Yes, those Patriots. Good luck with the 2nd book! You can't go wrong w/ anything bacon (until Topchef last week proved otherwise). If it's just me, some good ol' leftovers but when people are over, I like the help yourself plays. Nachos, brownies, tacos, pulled pork...Yeah you said it best. You can't go wrong w/ Mexican. Congrats! That sandwich looks marvelous! I don't care for American footbal, but I am very excited about your second book! Congratulations! You deserve it! Congrats on having your second book published Susan. Congratulations - can't wait to hear the details of your second book. Love the sandwiches - great alternative to the usual pulled pork. My hubby will love these. Mmm, nachos. And chili. Chili just goes with football. And those pickles on that sandwich make it look so yummy! Congratulations on the new book deal! How exciting! Football is all about yummy food that is easy to eat with your hands! Those sandwiches look perfect! Congrats on the second book! Looks like you have a real double header tonight--the pats and the Chargers. We loves us some homemade pizza during games. Grab a beer to go with that and you are set. I'm a fan of any meal that is simple, delicious and still lets you hold a beer in your other hand! Congratulations Susan! Sounds like some good tailgate grub in that book! I can't wait to hear more. That's wonderful news! I'll be looking forward to it! And that sandwich might just turn me into a football fan afterall. Congratulations on your second book :-) And the pork tenderloin looks so delicious...can almost taste the crunchyness of the crust...yummie! Congratulations on your second book Susan! I do more baseball food than football food and it is usually Mexican. This is wonderful news. Congrats! Those look fabulous! I love crusting meats with cornmeal. Such a nice change of pace from bread crumbs. Congrats on your second book! I love your rules for football food. It all sounds perfect. My husband's favorite football food has to be a big bowl of salty, buttery popcorn. But I'm sure if I spoiled him like you do your husband, he'd be a happy fan, too. Congrats! Looking forward to both of your books! Go Lions...um...maybe not! :) One would think they might be able to beat last year's "record" though! These sandwiches sound great! Perfect football watching material. Congrats on the second book! A second book Susan, well that's just great news - well done. you have me curious about that book - even though I am vegetarian I am keen to see your bacon in dessert! Another book? 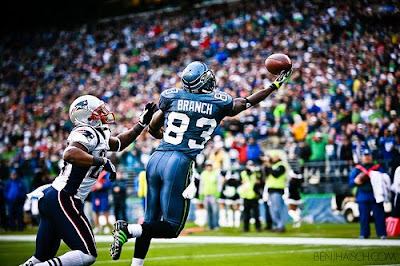 About American football? My boys would love that, but I'll stick to the sarnies, LOL! sig-At least you like the grub. 1 out of 2 ain't bad! sean-I'll be coming over your house next week! rita-That's kind of you to say. elaine-Yeah, and they're a lot easier to make too! pastyk-You just can't go wrong with sandwiches. tastyeatsathome-Now that T.O. 's gone, I may be able to start rooting for the Cowbowys in some games! And those pickles are ridiculously delicious on that sandwich! george-I'm with you. I love to make homemade pizza on Sundays while football is on. It's so good. barbara-That's what I like to hear. juliana-You should hear the crunch when you bite into it! nanette-I always think of sausage and pepper sandwiches for baseball viewing. It's a Red Sox thing. elly-I agree. The cornmeal has so much texture and added flavor. maria-I know. And poor Brian Urlacher. That's awful. But hey, congratulations on the second book. 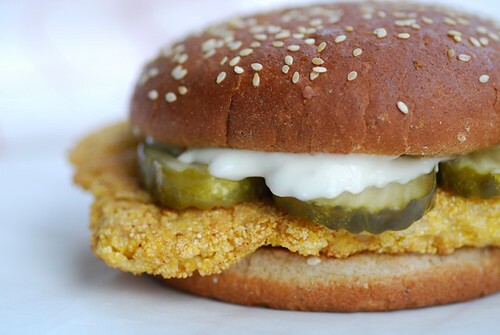 When I was growing up, pork tenderloin sandwiches were a favorite in my family. Congratulations on your second book! Oh, I love football and Emmett! This is a message to let you know that your blog is the feature of the Daily Blog Review today. joey-I couldn't agree with you more! lisaiscooking-I'm assuming you grew up in the Midwest? lisa-Emmett is pretty cool. And thanks for the feature! I'll be right over to check it out! Looks like some delish football food! This looks tasty! and congrats on the book. Great meeting you two at BlogHer, but after reading this post I realized nobody's perfect. Patriots?! I suppose it makes sense, but still. Go Big Blue! I'm excited about the two books Susan. This will be a good read.